A few years ago I was lucky enough to review and photograph an Italian artist who has, hugely successfully, vocaslly bridged the genres of opera and popular music. Andrea Bocelli is uniquely equipt to sound convincing at the top of the world’s pop charts or performing opera at La Scala (although to some ’serious’ critics he has no right to…). 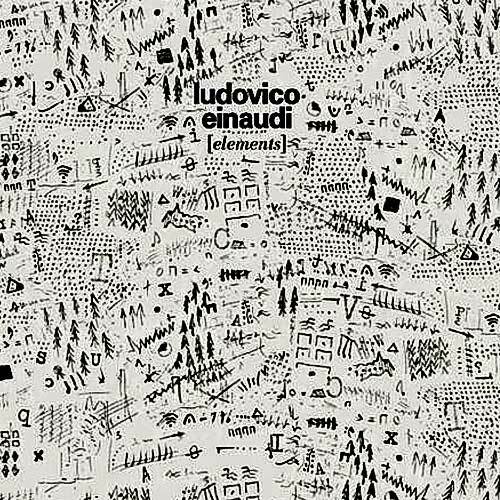 The reason I mention this is that Italian Ludovico Einaudi has parallels with this instrumentally. 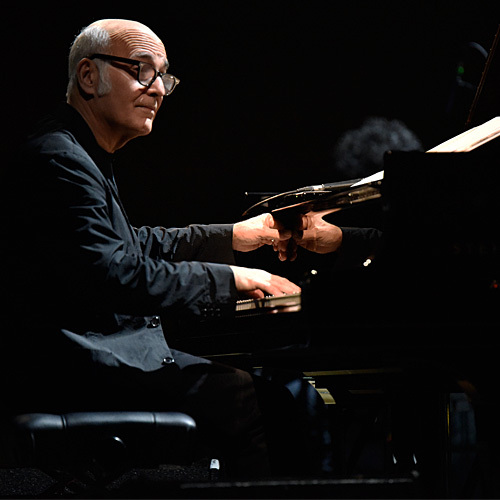 Classicly trained Einaudi’s ELEMENTS album released in 2015 is arguably his most modern set of compositions to-date while still including strong pointers to his classical heritage. 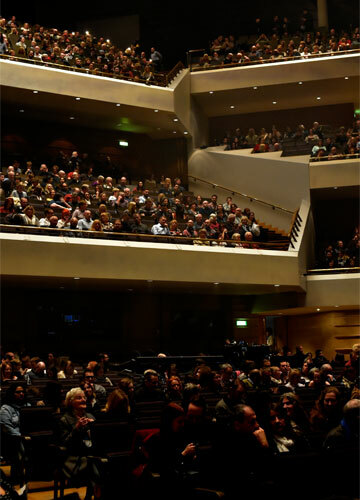 Tonight’s concert is being held at Manchester’s wonderful Bridgewater Hall venue. As I wait by expansive stage I look back at the auditorium with its raised, crowded galleries which reach ip to the heavens the heavens (usually some of the highest in the country’s venues). A single, monotone piano note plays providing a fairly solid clue as to what is about to follow on stage. 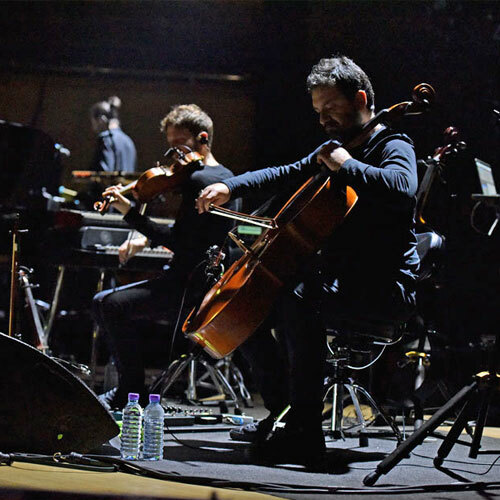 Eventually the music changes to something more orchestral as the lights dim to darkness and band members, five in all, take their places behind cello, violin, keyboard, percussive and other unseen instruments. Tonight’s concert is in two halves separated by a twenty-minute intermission. The first includes songs from the new ELEMENTS album. The second half includes music both new and old. Through the dim dark I see a figure walking slowly towards the centre-stage piano. 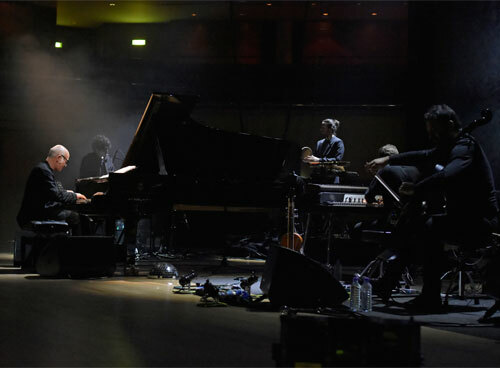 Einaudi sits with his back to the capacity, clapping audience. Now I’m only allowed two songs to photograph and witness but I manage to stay for two further songs before I’m politely removed. However, it’s enough to establish the quality and surprising accessibility of this quite unique artist. In addition, I’m impressed with his five skilled, young musicians without whom the pieces would be incomplete and less dramatic. 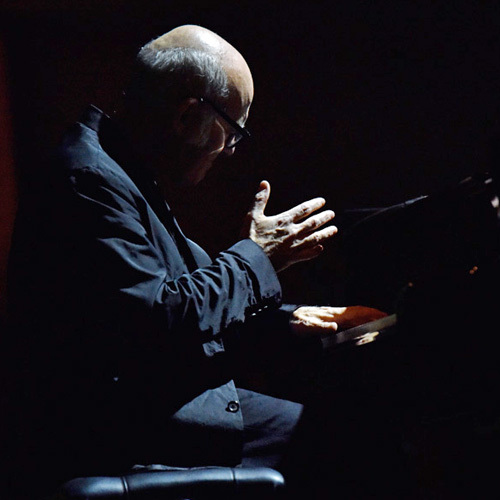 Through my long lens I watch Einaudi’s face and hands to see emotion and expression. Twice I see him gently brushing his hand along the piano above the keyboard while playing, perhaps in tune with the song’s rhythm or some emotional outpouring…The music is breathtaking, subtly melodic and at times strongly rhythmic, at times classicly lyrical. ”Drop” opens and builds from glacially slow piano notes until eventually strings join before a epic percussive notes end the piece. It could have hardly have been more mesmerising or emotive. “Whirling Winds” is a fine illustration of a descriptive narrative. The opening piano notes sound like a gentle breeze but then gather pace as other instruments join to create the most epic and beautiful crescendo of sound. “Petricor” opens with relentless slow rhythmic piano notes behind mournful and reflective violin and cello util the pace picks up quite dramatically when percussion also joins the fray. It’s a epic, stunning, spine tingling piece that builds and builds before slowing down to a trickle of piano and string notes then picking up rampant pace again. A crashing crescendo arrives before the final slowing piano notes melt away to nothing. 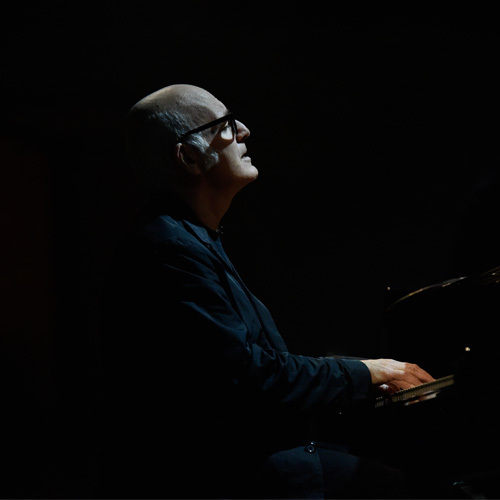 ”Night” is arguably Einaudi at his most melodic, accessible and lyrical. It’s a gently flowing composition that sounds like a rippling stream. It’s punctuated by more solidly struck notes and eventually a chorus of swaying strings that transport into the next set of tumbling piano notes and back again. It has to be a major highlight of the evening. Listening to an album one seldom gets the whole story. With Einaudi’s ELEMENTS I think this is particularly true and tonight proves it. With the album’s cover forming the show’s main gigantic video backdrop, the songs I witness come to life in this glorious live environment. To put it simply, I’m blown away; captivated, enthralled and very moved.